Who doesn’t love hummus? If you do, you will love this cake made from tahini, created with a fall touch of pumpkin. Originally made in Greece for the Lent season, it has an absence of animal products (eggs and butter) for those participating in the fasting ritual. For those of you who haven’t worked with tahini, it can be found in a jar in the Middle East cooking section of your grocery or near the nut butters. Tahini is a thick paste made of ground sesame seed. It’s used to flavor various popular dishes. You may want to visit my recipies for Greek Hummus and Falafel Sliders. I added pumpkin, raisins, nuts, and spices to give it a Fall twist. With the addition of pumpkin it gives the cake a dense thick bar-like texture, so serve small pieces as they go a long way. Serve with a scoop of Greek yogurt, fresh fruit or a dash of powdered sugar. For a larger crowd double this recipe and place in a 9 x 13 baking pan. An unexpected but appealing compliment to your holiday table. 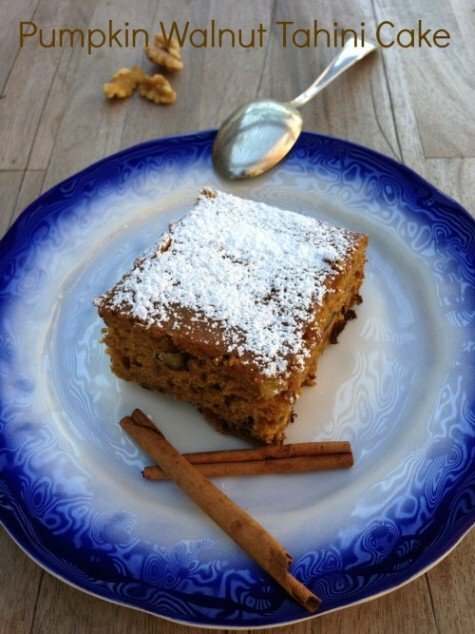 This cake can be made without the pumpkin, just use 1 cup of tahini to the recipe. This versatile cake can be baked and served with Greek yogurt, fresh fruit and and berries. This cake with it's dense nature goes a long way, so cut the pieces small. For fall treat serve with roasted pears. Beat tahini and pumpkin in a blender for 2 minutes then add sugar. Combine the 2 tablespoons of orange juice and baking soda in a small bowl and add to mixture. Mix in thoroughly. Sift the flour with cinnamon and add the walnuts,and raisins. Add the flour mixture and orange juice alternately to the tahini batter on low speed or by hand. Butter a 9x12 inch baking pan and line with buttered parchment/wax paper. Pour in the batter and bake for 40-45 minutes. Serve with Greek yogurt, fresh fruit,berries or a dusting of powdered sugar. 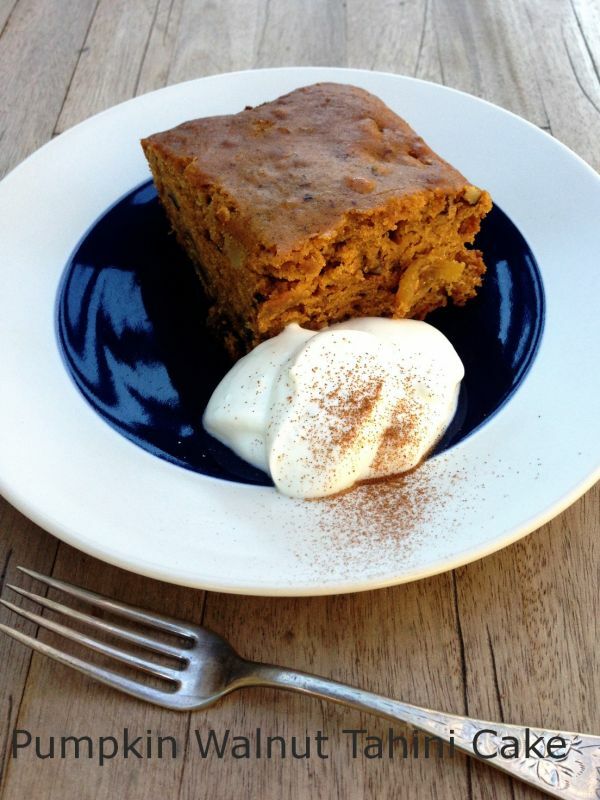 This cake can be made without the pumpkin, just add 1 cup of tahini to the recipe. Hello, I found your blog when searching for Greek gardens and I’ve enjoyed reading your posts 🙂 This cake looks sensational, I love that it’s vegan (like me) and that it contains tahini! I love tahini, I mix it up with some raw cacao powder and maple syrup and have it as a spread (or eat it with the spoon…) I’ll hopefully make this cake soon before our Australian summer really kicks in. Thanks for posting it! 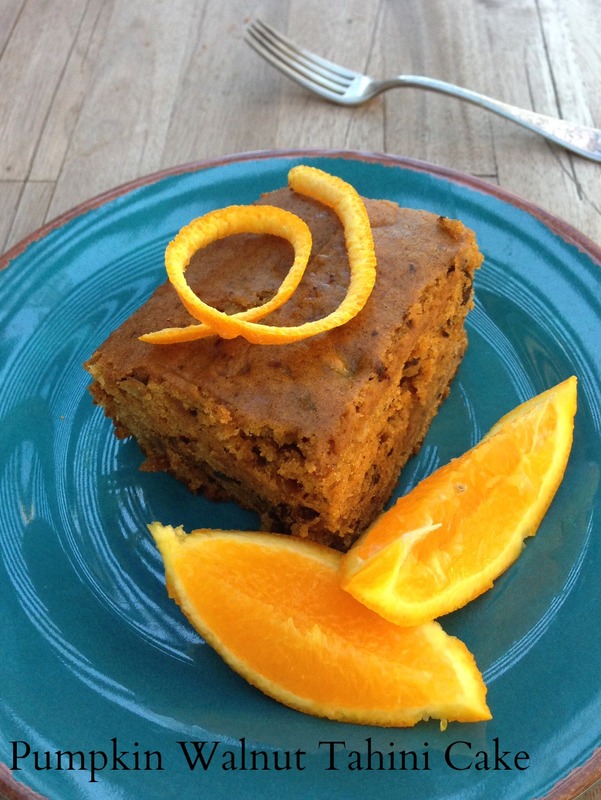 You will enjoy the tahini cake with or without the pumpkin. Just use 1 cup tahini. Enjoy your cake and thanks for stopping by!